In its original guise back in 1985, the Conservation Leadership Programme (CLP), as it is known today, funded only a brace of projects, both focused on birds. The programme has grown and evolved significantly over time and now our teams’ work covers a broad range of taxonomic groups. Nevertheless, during its distinguished history, almost one third of the projects supported by the CLP have related to threatened bird species. Generally speaking, conservationists tend to have some interest in birds, or at least to understand and appreciate their importance. Over the centuries, birds have been bringers of good fortune, harbingers of death, symbols of love and hope. They have been adored, persecuted and widely studied, but rarely ignored. The relative abundance and accessibility of the more common species means that birds frequently provide the catalyst that sparks an interest in nature among the wider public. Almost half of the world’s 10,000 bird species have a practical value in our lives. Many are economically important: colonial powers thrived on the guano trade; birds consume insects that would otherwise eat our crops; they disperse seeds and pollinate plants; and they are worth billions of dollars to the food industry, tourism and trade. Evidently, bird conservation is no longer just about birds, as two recent CLP-funded projects illustrate. In Southeast Asia, vulture numbers have been in free fall, plummeting by over 90% since 1992. The cause and speed of the decline initially left specialists baffled, until researchers discovered that the anti-inflammatory drug diclofenac, used by vets on cattle, was lethally toxic to vultures that consumed the flesh of dead livestock. 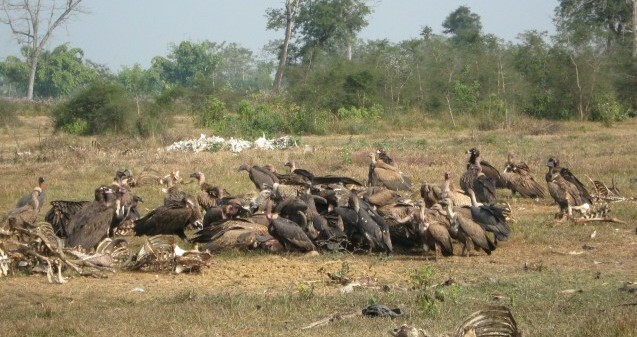 Veterinary diclofenac was banned in India and Nepal in 2006, but was immediately substituted with another form of the drug, and vultures continued to die. Vultures may not be the prettiest or most popular of birds, but they provide a crucial service by devouring rotting carcasses that would otherwise pose human health risks and attract packs of rabid dogs. The socio-economic impact of a sharp reduction in vulture numbers is considerable. It has been calculated that the demise of vultures and subsequent increase in rabid dogs in India may have resulted in around 50,000 additional human deaths from rabies, at a probable cost of over US$30 billion to the nation’s economy. A team of young Nepalese conservationists supported by the CLP and Save Our Species completed a project that had fed into a regional campaign to save Asia’s vultures from extinction. The team surveyed vulture nests to record breeding success rates and also monitored potential threats (intentional poisoning, habitat destruction, electrocution from power lines, nest disturbance and direct attacks on vultures), but the main success of the project was its contribution to the removal of diclofenac from the market and the promotion of an alternative drug, meloxicam. The combined efforts of the Nepalese team, other conservation organisations, local government, the veterinary fraternity and local communities led to Nawalparasi district in central Nepal, on the border with India, being declared a Diclofenac Free Zone (DFZ). The DFZ was one of 11 such zones, declared roughly simultaneously, which collectively cover an area totalling over 22,000 km2 (approximately the size of New Jersey or Wales) and constitute the world’s first provisional vulture safe area. Another CLP-funded team faced a different challenge. Rather than ranging across whole continents, their target species – the chestnut-bellied hummingbird and Niceforo’s wren, are confined to the Chicamocha Canyon, nestling in the Colombian Andes. This arid landscape, characterised by spiny shrubs and cacti, has been subjected to considerable land fragmentation, burning for agriculture, and goat grazing, which have destroyed all but 1.5% of the original dry forest. In addition to tackling the principal threats to these birds, the team also set about protecting areas of suitable habitat. The findings of its surveys and ecological studies led to the site being designated as an Important Bird Area – an internationally recognised status highlighting it as a priority site for the conservation of birds, as well as other animals and plants. Two years later, the team went one step further and, collaborating closely with landowners and a national NGO (Fundación ProAves), secured an area of land under more formal protection as a natural bird reserve. They subsequently set up their own organisation, Fundación Conserva, to strengthen conservation efforts in the region by identifying and safeguarding more suitable areas of habitat and involving the local community in their activities. Although some members of the conservation community tend to get into a flap about the amount of funding directed towards bird conservation, the reality is that bird conservation is often the gateway to the protection of many other species, ecosystems and communities.